Having been e-commerce sellers ourselves, we know what kind of challenges you’re up against. Time is in short supply and every moving part seems to take your energy away from what’s important: growing your business. We created the 360° Portal with the intention of helping e-commerce professionals navigate the sourcing industry more easily, allowing you to view and manage all aspects of your business in one place. Our Portal takes the inconveniences, information delays, and headaches out of coordinating your sourcing – all the way from finding a supplier to putting the products at your warehouse’s door. After placing an order with us, our system automatically creates user credentials and emails you the link to the Portal. 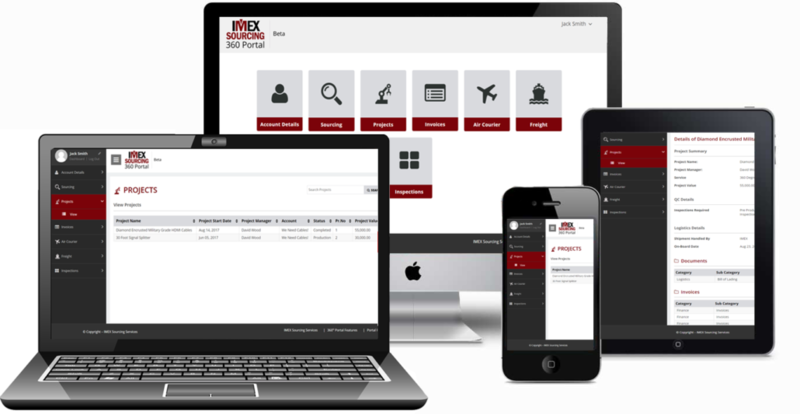 After logging in, a simple user interface allows you to navigate through various parts of your business, finding whatever information you need and downloading any documents you require. Our Project Managers and Sourcing Assistants continue to provide you the strongest sourcing support in the industry, negotiating on your behalf for the best quality and prices, writing the strongest contracts, and handling all issues directly and immediately, and our Portal means being able to immediately see and manage the results of our efforts on your behalf. One place with all the information you’re looking for! See all relevant information and updates to all of your projects. You’re able to easily access the status of production, payments, and any other detail. From invoices to documents, message exchange to air couriers – we’ve got you covered! All updates are live, and represent the latest information on hand. Say goodbye to lengthy email exchanges and misplaced attachments, it’s time for modernity to kick in. No more attachments lost to the oceans of your overflowing inbox! All invoices and documents are available on our Portal. These can be viewed online or downloaded in a PDF format. This can improve the speed of your business. If Customs urgently request specific documents for clearance, login to the Portal and get all project related documents in one place. You won’t have to wait 12 hours for your Account Manager to come online in China or 2-3 days in case of a weekend. We provide regular updates to all sourcing and production projects. Our team will send notes to clients on a regular basis, informing them of any developments. The portal supplements the AM and does not replace them. You can still talk to your AM’s through Skype, E-Mail or calls. When sourcing or production statuses change. Do you like working with tech-savvy partners?